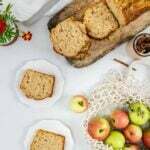 Apple Cinnamon Bread is a not-too-sweet bread that is loaded with apple chunks and flavored with fall spices. Our house smells mesmerizing when it’s baking. As fall is my favorite season just like many folks around me, I’m trying to fully enjoy it with the help of fall flavors in my kitchen. Although I love to try new soup recipes in this time of the year, testing bread, cake or cookie recipes makes me crazy excited. Who doesn’t like baking on chilly days? Apple and cinnamon make the best combination in the oven. 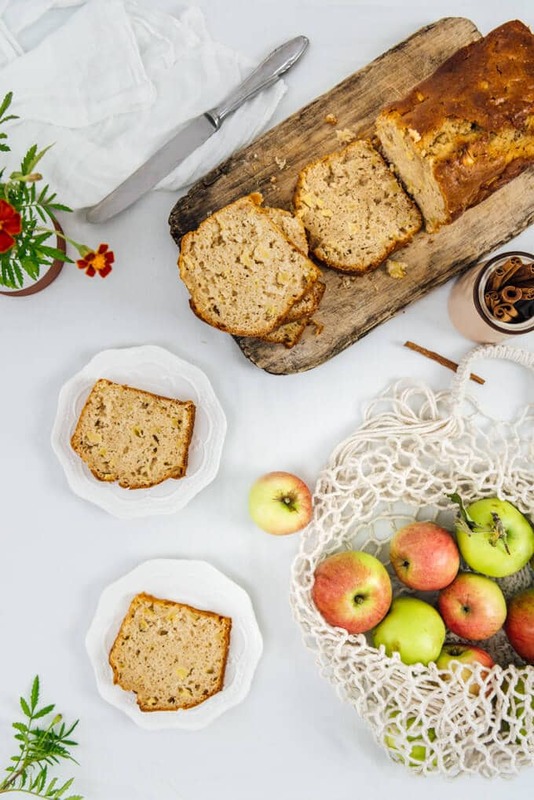 Can you imagine the smell in the house when you bake this Apple Cinnamon Bread? I must warn you that your neighbors will knock your door. Doubling the recipe might be a good idea. You might have noticed that I have a weakness against pumpkin during this month. I’ve shared several pumpkin recipes on the blog that are perfect for fall. To get an idea about those recipes, please write pumpkin in the search box on top of the page. I’ve already made my own pumpkin puree (which has a video in the recipe) and put it in the freezer in bags for later use. However, I decided to focus on apple recipes this year when I saw the abundance of apples my lovely husband bought from the local market. Our son’s favorite fruit is apple. He loves it so much that he can even have an apple or two or even three for lunch or dinner. That’s why we always have a lot of fresh apples in a bowl on the counter. The biggest advantage of having food blogger parents must be the variety of recipes your mom and dad test in the kitchen. Plus, you always have the right to criticize what they make. They listen to you as if you were a gourmet! At least this is what happens in our home. I trust our 4-year-old son’s taste so much that I take his words into consideration and play with the recipe a few times to get the best result. He is a perfect guide to us in our culinary adventure! I used sweet apples in this recipe. Not sure about their names though. It is not a must but I think sweet apples are better to make this apple cinnamon bread. If you have sour apples on hand, it might be a good idea to increase the amount of sugar a bit. 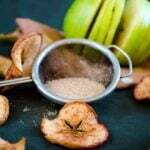 If you are craving for something based on apple and cinnamon but don’t feel like spending time when making it as in the Turkish Apple Cinnamon Cookies (oh my I can eat them every single day!) 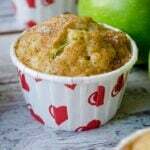 I shared on the blog some time ago, give this quick apple cinnamon bread a try. You will love that each slice is packed with chunks of fresh apples. As for our little gourmet’s thoughts on this Apple Cinnamon Bread, he first complimented on the smell and had a quick bite. He asked for some cream cheese to spread on the slice and started to express his thoughts. He LOVED the apple chunks! I mostly shred apples when baking, and it was the first time I added it in chunks. He says it makes a great breakfast with his favorite cream cheese. Maybe I can try another apple cinnamon bread recipe that is filled with cream cheese next time. Have I already told you that he always inspires me for new recipes? We’re so lucky to have this little guy in our life! BTW I must tell you that I have already started to make my plans on a new apple recipe. Wish I had seen Michael’s Spiral Apple Bread on his lovely blog Inspired by Charm before. It looks and sounds amazing! Will give it a try asap and share my thoughts with you. 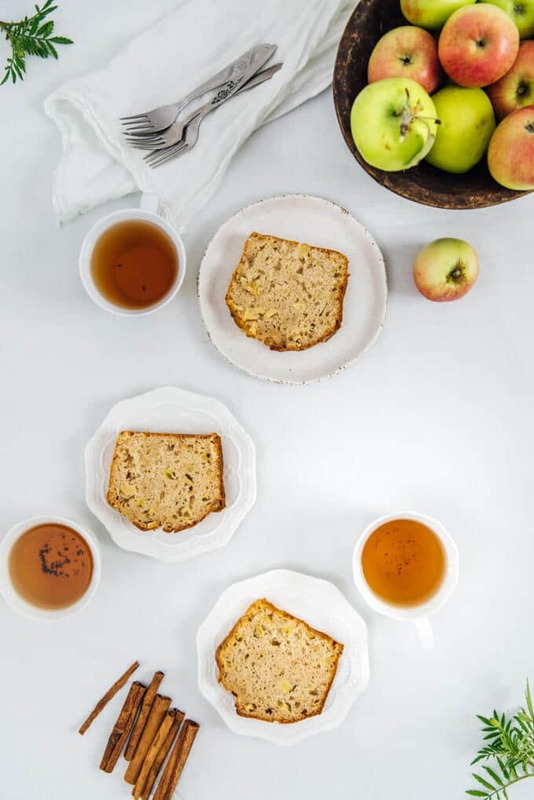 A quick apple bread packed with apple chunks and cinnamon. Preheat the oven to 350F. Grease an 8X4 loaf pan and set aside. In a large bowl, whisk together the eggs and sugar until smooth. Add in yogurt and olive oil and mi well. In a medium bowl, whisk together the flour, baking powder, salt, cinnamon and nutmeg. Slowly add this in the wet mixture and mix just until they combine. Fold in the apple chunks and pour into the prepared loaf pan. Bake for 50 minutes or until a toothpick comes out clean. You can check it after 45 minutes. Cool it in the pan for about 10 minutes. Loosen the sides using a knife and remove it from pan. Cool completely on a wire rack before slicing. Thanks Ececim! Happy to hear that you love it. Hope your lovely family loved it too.